Product categories of Graphite Electrode, we are specialized manufacturers from China, Graphite Electrode, Discharge Graphite suppliers/factory, wholesale high-quality products of Graphene Battery R & D and manufacturing, we have the perfect after-sales service and technical support. Look forward to your cooperation! 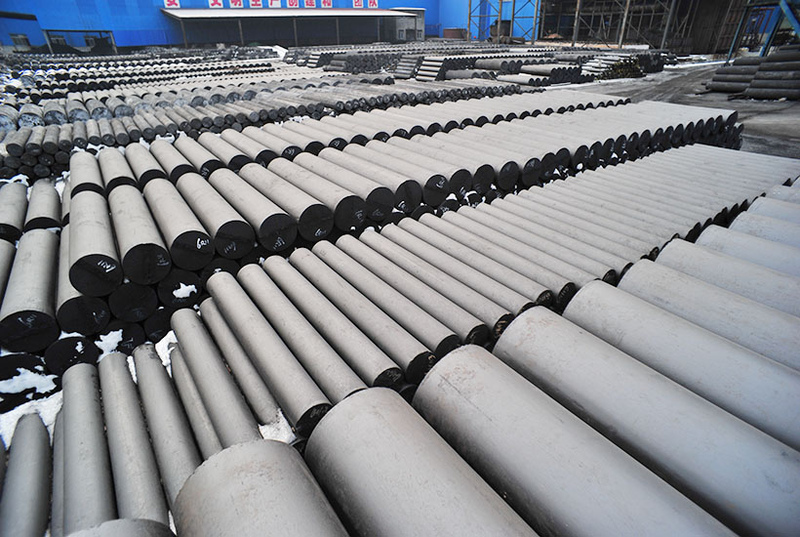 Graphite Electrode, mainly in petroleum coke, needle coke as raw material, coal tar pitch as a binder, calcined, ingredients, mixed kneading, pressure, roasting, graphitization, machining and made in the arc furnace in the form of arc The energy can be divided into ordinary power Graphite electrode, High Power Graphite Electrode and Ultra High Power Graphite Electrode according to its quality index. 1, graphite electrode in the long-distance transport to be covered with anti-rain Pengbu. 2, with lifting machinery unloading wooden box packaging electrodes, you must use the wire rope, not directly hook the electrode steel packing belt for lifting. 3, in order to protect the electrode end and thread, not directly with hook hook electrode hole hanging electrode. 4, loading and unloading joints box, you should gently take to prevent damage to the thread. 1, the electrode should be stored in a clean, dry place; temporarily do not use the electrode and connector, do not remove the packaging, to prevent dust, debris fall into the thread or electrode hole, affecting product docking accuracy. 3, the electrode in the Treasury storage to be placed neatly, the electrode stack on both sides to pad well, to prevent the cartoons. 4, bulk electrode stacking height is usually not more than 2.8 meters, the height of the box electrode should not be more than 4 layers. 5, the temperature of the place where the joints should be stored should not be too high to prevent the asphaltene joint bolt melting. 1, by the wet electrode, before use to dry. 2, remove the spare electrode hole on the foam protective cap, check the electrode hole thread is complete. 3, with no oil and water compressed air cleaning spare electrode surface and hole thread; to avoid the use of wire or metal brush cloth cleaning. 4. Do not touch the threads in the electrode holes where the joint is carefully screwed into one end of the backup electrode (it is not recommended to insert the connector directly into the electrode that is replaced on the furnace). 5, the electrode spreader (recommended the use of graphite material spreader) screw into the other side of the electrode electrode electrode hole. 6, lifting the electrode, the mat soft objects to the bottom of the alternate electrode assembly to prevent the ground to break the joints; with a hook into the spreader after the lifting ring, lifting the electrode to be smooth, to prevent the electrode from the B-loose Off or collide with other fixtures. 7, the spare electrode hanging to the top of the electrode to be connected to the electrode hole slowly after the fall; rotating the backup electrode, so that the screw hook and the electrode with the rotation down; in the two electrode end distance 10-20mm, again with compressed air Clean the two ends of the electrode and the exposed parts of the joint; in the final complete discharge of the electrode, not too much, or because of violent collision, will lead to electrode holes and joints of the thread damage. 8. Tighten the backup electrode with a torque wrench until the ends of the two electrodes are in close contact (the correct connection of the electrode and the connector is less than 0.05 mm). 2, the electrode connection found cracks exist to identify the cause, to eliminate the gap before use. 3, connecting the electrode, found that the phenomenon of joint peeling off, to fill the joints and then connect the bolt. 4, the electrode should be used vertically, to avoid tilting operation, in particular, can not be connected to a group of electrodes placed horizontally, so as not to break. 5, to the furnace into the charge, the bulk material should be installed near the bottom of the furnace to reduce the collapse of the large pieces of charge impact electrode. 6, smelting, should avoid a large number of insulation material stacked in the electrode just below, so as not to affect the use of electrodes, or even electrode break. 7, the electrode in the rise or fall, should avoid touching the lid, resulting in electrode damage. · 8, in the smelting site, to avoid slag splashing to the site of the electrode or connector threaded buckle, damage the thread accuracy.